The goal here is to predict the path of a photon near a non-spinning, uncharged black hole. Spacetime near such a black hole is described by what is known as the Schwarzschild metric in the theory of general relativity. Without any loss of generality one can assume the starting location of a photon to be on the x-axis. Let the distance of this starting location be $r_0$ from the center and let $\delta_0$ be the angle that this photon makes with the x-axis. This is shown in the figure below. 0. A photon starting at $r_0<2M$ will never escape outside $r=2M$. Thus $r=2M$ defines the size of a Schwarzschild black hole. 2. A photon starting exactly at $r_0=3M$ will (1) eventually fall into the black hole if $\delta_0 > \pi/2$, or (2) go in a circular orbit around the black hole if $\delta_0 = \pi/2$, or (3) eventually escape to infinity if $\delta_0 < \pi/2$. where $u=M/r$. This equation is obtained by differentiating Eq. 25.57 of MTW w.r.t. $\phi$. Since the physics here scales with the mass of the black hole ($M$), we will do all calculations assuming $M=1$. If needed, converting distance to physical units can be done by multiplying values of $r$ by $GM/c^2$. In other words, the radial coordinates here in units of gravitational radii. and the set of two differential equations in Eq. (6) can be solved using the two initial conditions given in Eq. (7) and Eq. 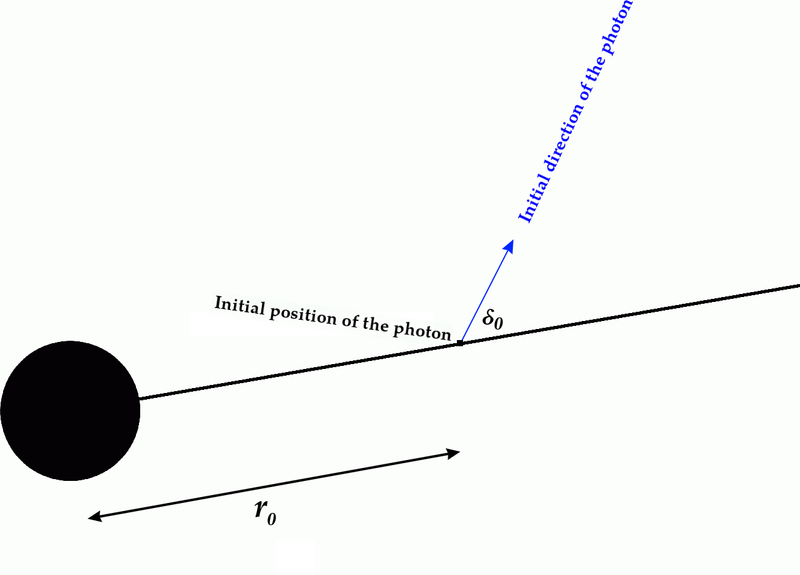 (10) to obtain the trajectory of the photon.